Normally, I would simply buy blanched almonds, but this time I decided to try the home blanching procedure Costantino gives (Mandorle Pelate, p. 189). It’s not at all difficult, indeed the same as any blanching procedure, but tedious: the point is to remove the skin of the almonds, and blanching does soften the skin sufficiently to do so, but you’re still left standing there over a bowl of slippery wet nuts squeezing them out of their outer coating one by one. 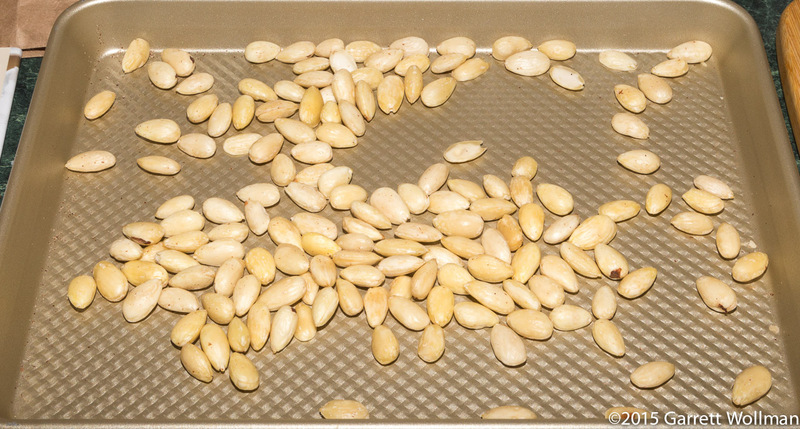 Then once you’ve extracted all of the nuts, they have to air-dry on a baking sheet before you can do anything useful with them. Perhaps if you have children of the right age to find this entertaining, but I would just as soon pay someone (or something) else to do it. That was Saturday, so now on to Sunday and the actual baking, starting with the mise en place. The recipe, as I said, is a pretty simple almond cake of the sort I’ve already done several of; it starts with four separated eggs, the blanched almonds, both powdered and granulated sugar, potato starch (a new ingredient for me), and lemon zest. The fat is provided by olive oil rather than butter, so this recipe is not only gluten-free it’s also dairy-free. 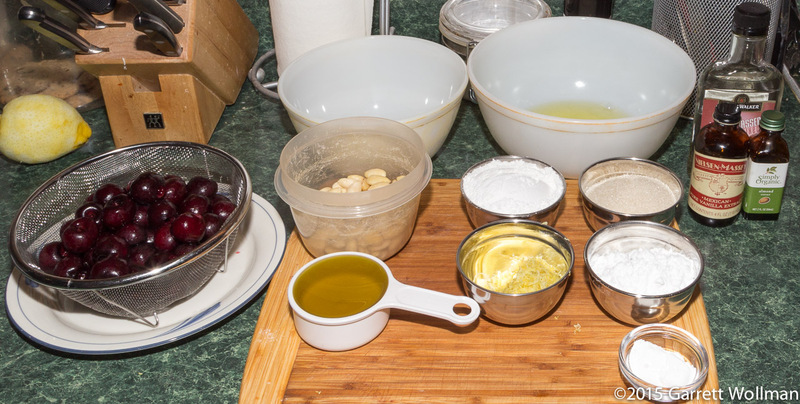 There’s some baking powder to provide leavening backup to the egg whites, and for flavoring — in addition to the pitted cherries — there are both vanilla and almonds extracts along with a beverage alcohol. The recipe calls for maraschino, but the only package store in town that carried it had just a huge $35 bottle, which is a lot to pay for something I’ll only ever use two tablespoons of, so I asked them to recommend a substitute, and they suggested Kirschwasser, which conveniently I already had. They cautioned that it would not be quite the same, since Kirsch, a brandy, would have less sugar and more alcohol than maraschino. 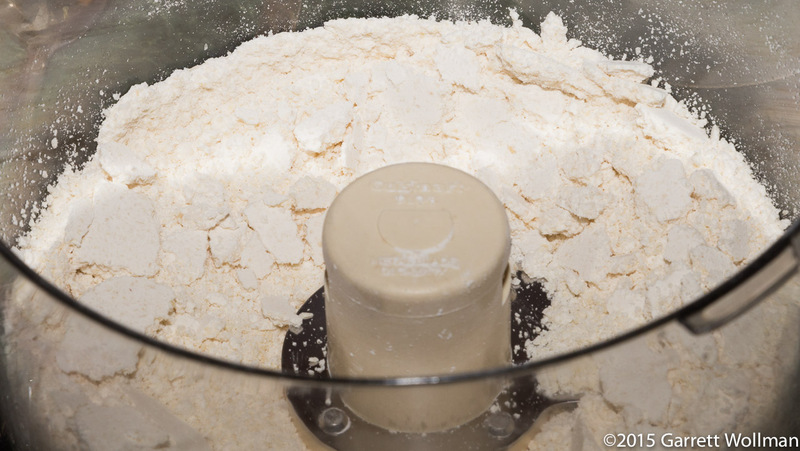 The first step in the recipe is to grind the almonds in a food processor, together with the confectioner’s sugar. The mixture is then pulsed together with the potato starch and baking powder. The next step, familiar if you’ve read any of my past posts about other cakes made by the soufflé method, is to make a meringue from the egg whites, a pinch of salt, and half of the sugar. The recipe in this case says to beat “until nearly firm peaks form, slightly curling over when you lift the beater”, and I thought this would make a great illustration. 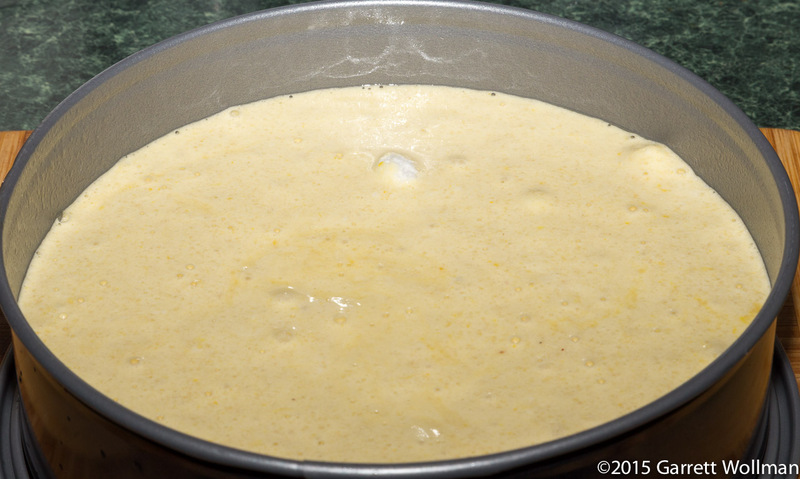 The next step is to beat the egg yolks and remaining sugar together to the ribbon stage. The recipe would have you do this in a stand mixer, but yet again, my stand mixer is simply too big to work with this small a quantity, so I used a hand mixer and a small bowl. (If there had been more sugar, it would probably have worked, but the beater in my stand mixer simply didn’t make enough contact with the yolks.) After mixing in the olive oil, lemon zest, and flavorings, the volume was large enough to transfer to the stand mixer for the next step (and getting a bit too big for the small bowl I had been using), mixing in the dry ingredients. 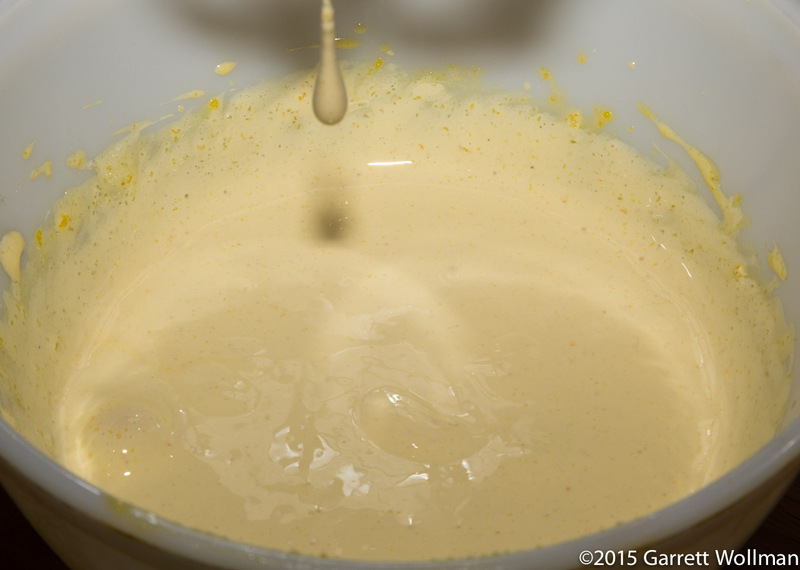 Now comes the heart of the soufflé method: folding the meringue into the egg-yolk base. 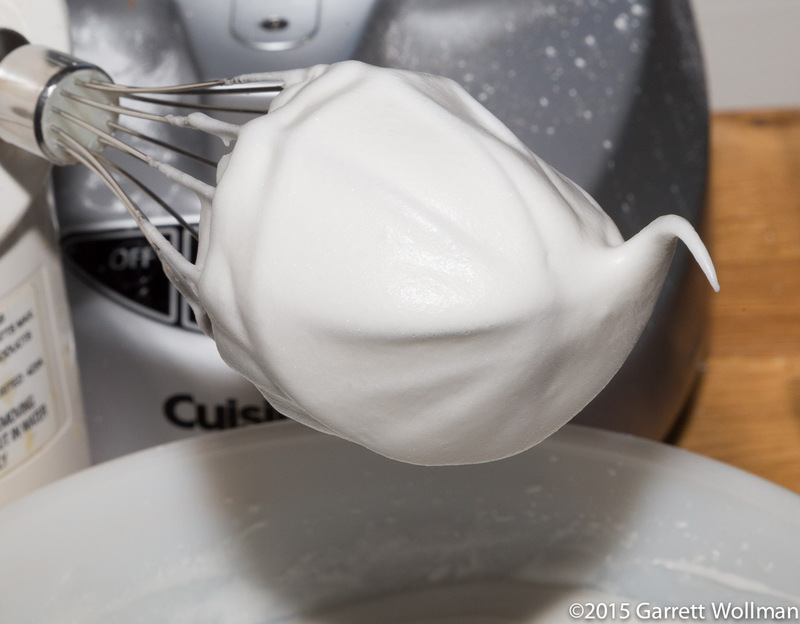 This is generally done by thirds: the first third can be done a bit roughly, as it serves primarily to lighten the heavy batter enough to accept the rest of the meringue without deflating too much. The second and third thirds require more care. The batter is carefully poured into a prepared 9-inch (24 cm) springform pan, and the pitted cherries are dropped on top — they quickly sink to the bottom. The cake is baked at 350°F (175°C) for about 45 minutes. I took the cake out a bit too soon — it could have used another five minutes or so, despite the outer edges being fully cooked — and as a result the batter in the center never had a chance to set properly. I warned my tasters about this, but nobody seemed much to mind; at least one person loved the “goo”. 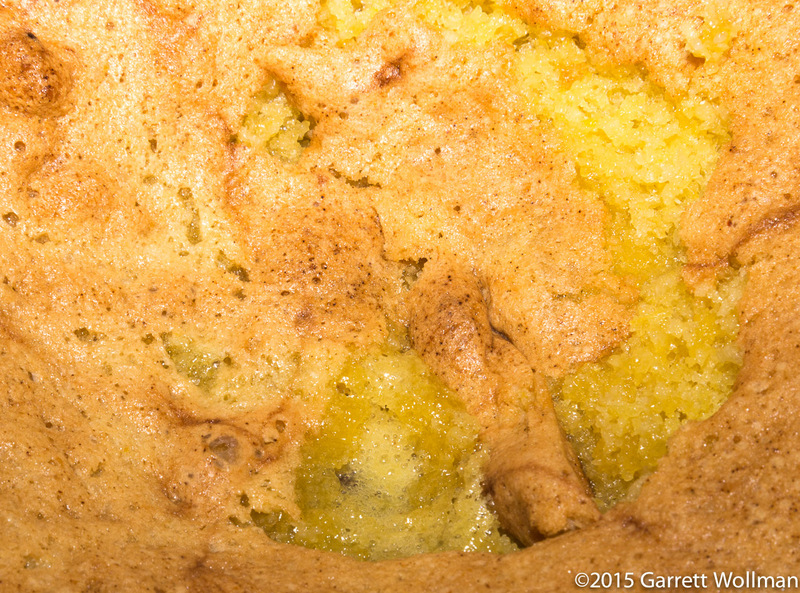 After removing the springform ring, you can see how the cherries all ended up at the bottom of the cake. The recipe gives a yield of 10–12 servings, and I was happy enough with the way the numbers came out at 12 that I did not feel the need to try to make 16 slices as I would with a layer cake. The figures below do not include a dusting of confectioner’s sugar added at presentation. 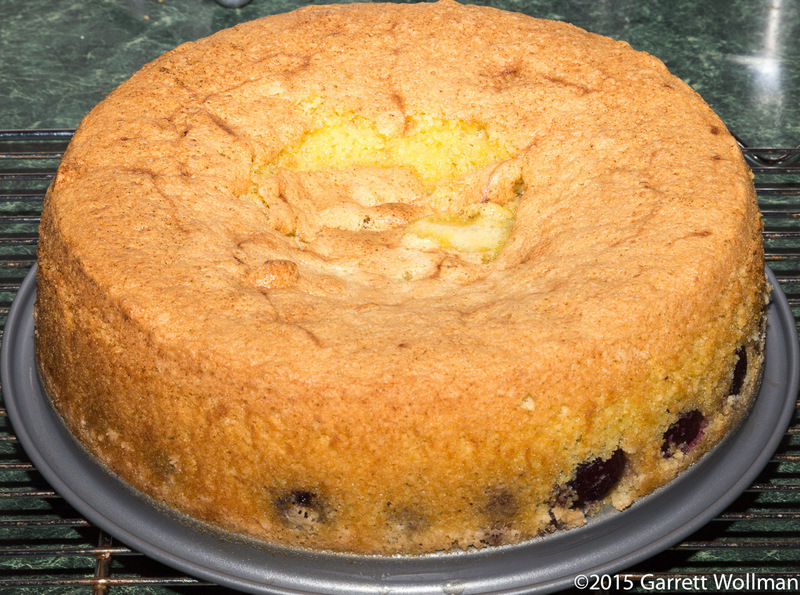 This entry was posted in Food and tagged almond cake, almonds, cake, cherries, recipe, Rosetta Costantino. Bookmark the permalink.